"Short in stature, deformed in person, and hideous in face", physician, scientist, journalist, radical and victim of an audacious assassination, Marat's life was blighted by illness, controversy and thwarted ambition. Highly ambitious and with a gift for making influential connections, Marat left home at the age of 16 with no formal qualifications and nothing but the desire to succeed. The young man travelled through Europe, teaching in Bordeaux and undertaking medical training in Paris before his travels took him to London and the artistic circle of Angelika Kauffmann. Remaining in England, he began to write on the subject of slavery, eventually producing the highly-acclaimed Chains of Slavery in 1773. Finally on his way, Marat returned to Paris and established a medical practice, eventually winning the lucrative position as a physician in the household of the comte d'Artois, later to become King Charles X. Not satisfied to rest on his already considerable laurels, Marat embarked on a programme of scientific discovery, extending his intellectual and political circle and continuing to publish increasingly radical works. Just as he abandoned his medical career in favour of science, so too would this new direction eventually be set aside in preference of a career in journalism, Marat's attentions now firmly set on the politics of revolution. The increasingly radical Marat began publishing his own newspaper, L'Ami du Peuple, in 1789. The paper was highly critical of Girondin leaders and he eventually found himself forced into hiding, fearing their vengeance. Not content with life as a journalist, Marat moved into politics when he was elected to the National Convention in 1792. His criticisms of the Girondins grew in both fury and scale and he began to call for violent action against them, a tactic that swiftly led to his arrest and imprisonment. Brought before the Tribunal, the persuasive, passionate Marat spoke in his own defence and when he was acquitted, his supporters celebrated uproariously. However, Marat's always poor constitution was further weakened by the stress of his experiences and he began to be plagued by a debilitating skin condition that left him covered in itchy, suppurating blisters. He increasingly took to his bath for the sake of comfort, conducting his business from this somewhat unorthodox office. When the Girodins fell in June 1792 Marat was already virtually housebound and increasingly isolated from his political allies, growing distant from the centre of power. On 13th July 1793 Charlotte Corday visited Marat's home, offering confidential information on the remaining, fugitive Girodins. The young woman was admitted to the bathroom which had become his virtually permanent residence and there followed a short conversation, after which she drew a knife from her corset and plunged it into his chest. 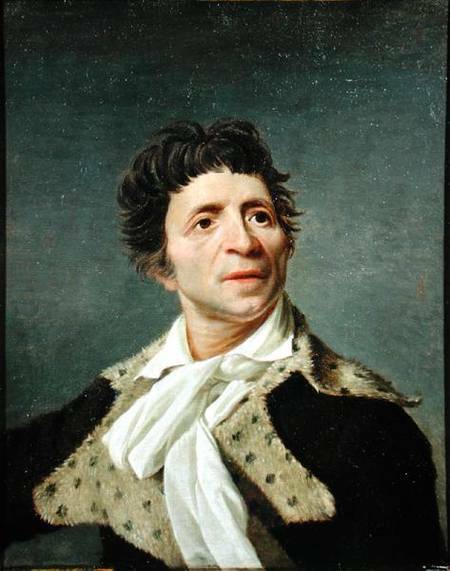 Within seconds Jean-Paul Marat was dead, the victim of a royalist Girondin who had achieved what his other enemies could not, to finally silence the ambitious radical for good. Four days later Marie-Anne Charlotte de Corday d'Armont went to the guillotine, telling her trial that she had "killed one man to save 100,000." In death, Marat briefly achieved the importance he had sought all his life. Immortalised in paint and sculpture, his funeral was attended by the most influential figures in Paris and he was held up as a martyr to the revolutionary cause. Eventually though this flame of adoration dimmed and Marat passed into memory, his name forever linked with that of Charlotte Corday, the woman who took his life on a summer day in 1793. It seems that Charlotte really struck a cord with the Gin Laners, earning herself her own entry. Read the story of Charlotte's life here! This painting of Marat in his bath must be one of the most indelible images of post revolutionary France. What a fascinating life he lead. It takes a lot of courage to be "radical," especially during that time! Love these paintings. Thank you; they're very powerful works! Thank you for your comment; he is a really fascinating character, however one comes down on the political side! If you visit the Musée Grévin in Paris, you can see Marat's actual bath with a waxwork Marat sitting in it! (Well, it is described as such by the Musée). An amazing museum, if only for the stunning Hall of Mirrors, created in 1900.